New Yorkers now have a new option to satisfy their craving for juicy, delicious sausage at Schaller's Stube Sausage Bar in Manhattan! In case you missed it, this past December we debuted Beyond Sausage. Now, we're thrilled to bring Beyond Sausage to its first restaurant in NYC! With 80 years of sausage expertise and heritage, we're beyond honored that Schaller's Stube feels Beyond Sausage delivers against their criteria of a great pork sausage. "We're always looking for ways to offer our customers something new and delicious, and have seen a significant increase in requests for alternative protein options. It just so happens, Beyond Sausage is the first one we've tried that actually tastes like the real deal," said Jeremy Schaller, 4th generation owner of Schaller & Weber. Beyond Sausage promises to deliver on the taste, texture, and look of a pork sausage but with less saturated and total fat. In the words of our CEO, Ethan Brown, "In keeping with our vision for enabling people to Eat What They Love™ while enjoying the health benefits of plant-based foods, we are pleased to bring Beyond Sausage to New York by way of Schaller's Stube,"
The Beyond Sausage links can also be swapped for any build on the Schaller's Stube menu. With 16g of protein per link, Beyond Sausage is a hearty option that is guaranteed to satisfy New York's meaty appetites! But what if you don't live in New York? Don't worry! 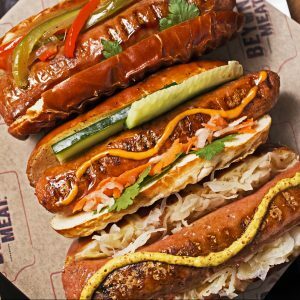 Beyond Sausage will continue to pop up at meat-centric locations around the country over the next few weeks, satisfying the cravings of sausage lovers nationwide. Be sure to follow us on social or subscribe to our newsletter (here) to be the first to know when Beyond Sausage arrives near you!